The muscle of RO&D in All Japan , Buchanan did the least of the group in terms of titles but still played an important part in keeping back the Voodoo Murderers. Wrestling mostly in tag matches in the middle of the card, Buchanan fared well against wrestlers such as Honma and Hirai. Buchanan came in 5th place in his bracket at the Champions Carnival and came in 4th (teaming with D-Lo Brown) at the Real World Tag League. 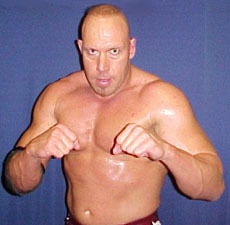 Buchanan took part in the 2006 All Japan Champion Carnival, but did not find a lot of success. He only managed one win in the tournament, and that win came against Keiji Mutoh, who had wrestled in two 30 minute draws at that point and was worn down. Buchanan teamed with D-Lo Brown in the Real World Tag League and together they did very respectable, including picking up a victory over Mutoh and Kawada.